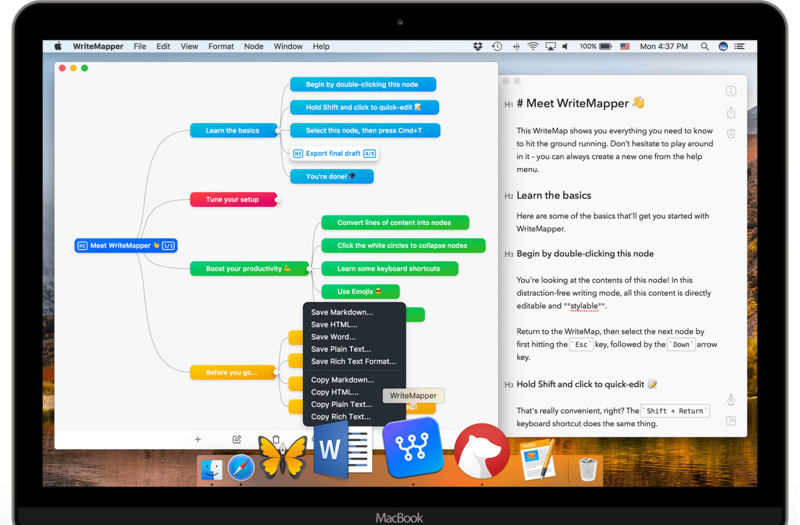 WriteMapper — Outlining software tool for your writing, using mind maps. From idea to final draft in no time. 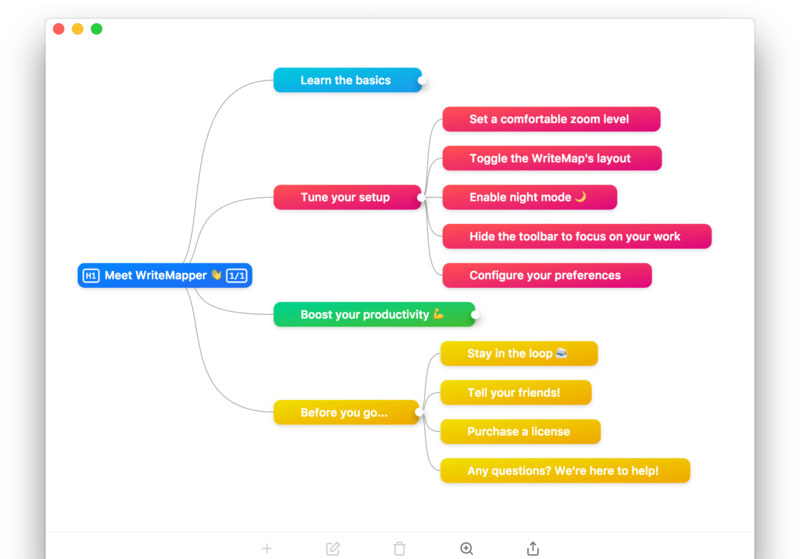 and easily produce text documents using mind maps. A WriteMap paints a thousand words. 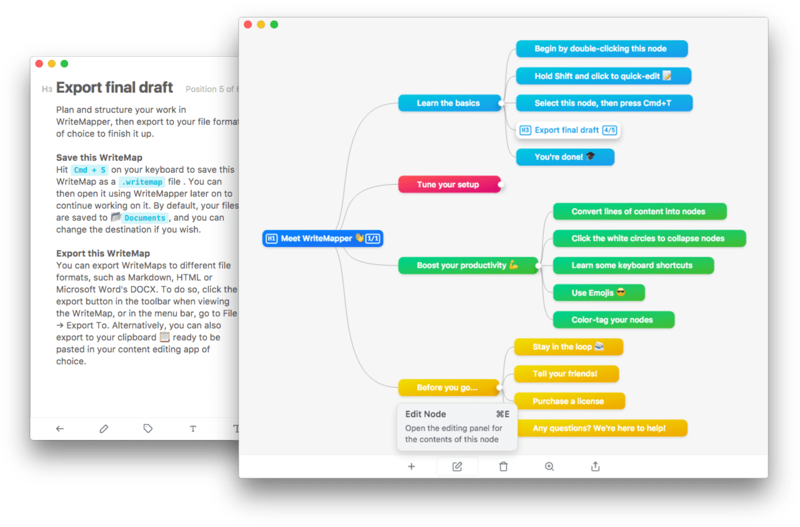 WriteMapper was built to leverage the visual nature of mind maps to give you a bird's-eye view of your writing structure. Just one glance is all it takes for you to get a good feel for the flow of your work. Brainstorm your way through writer's block. 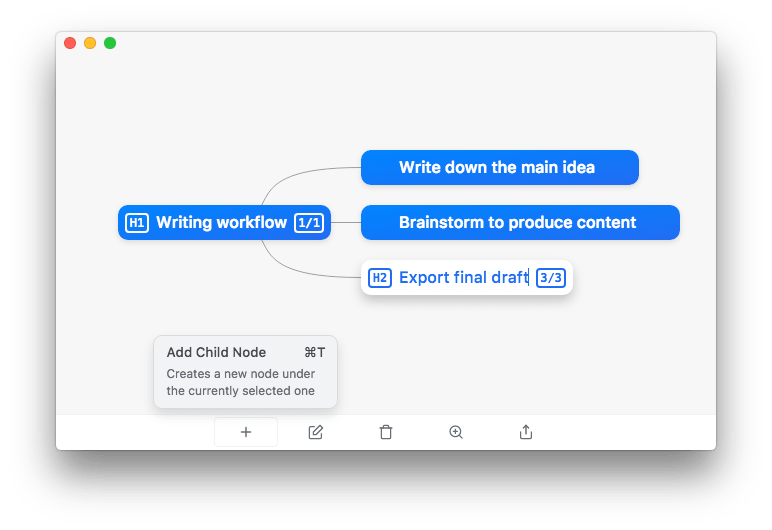 Each node on the mind map has a content section you can jump in to edit at anytime. Besides being able to style and format your writing however you like, you can also edit the title of each sub-point from this view as well. 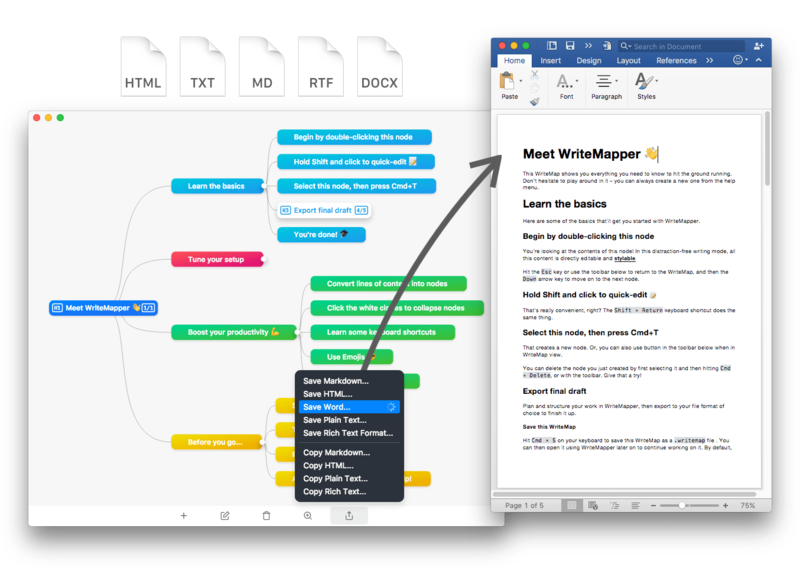 WriteMapper uses the nested structure of a mind map to automatically create and export a text document draft for you, right in your computer's file system. You can choose from a variety of file formats, including Markdown, HTML, Microsoft Word, plain text and Rich Text Format. There's way more to WriteMapper than meets the eye. Color-tag nodes to group them together. Boost productivity with keyboard shortucts. Overcome writer's block by brainstorming. Emojis are supported, so use them freely. Write, edit, and format, distraction-free. Auto-magically expand lines of text content. Manage your WriteMaps as you like. 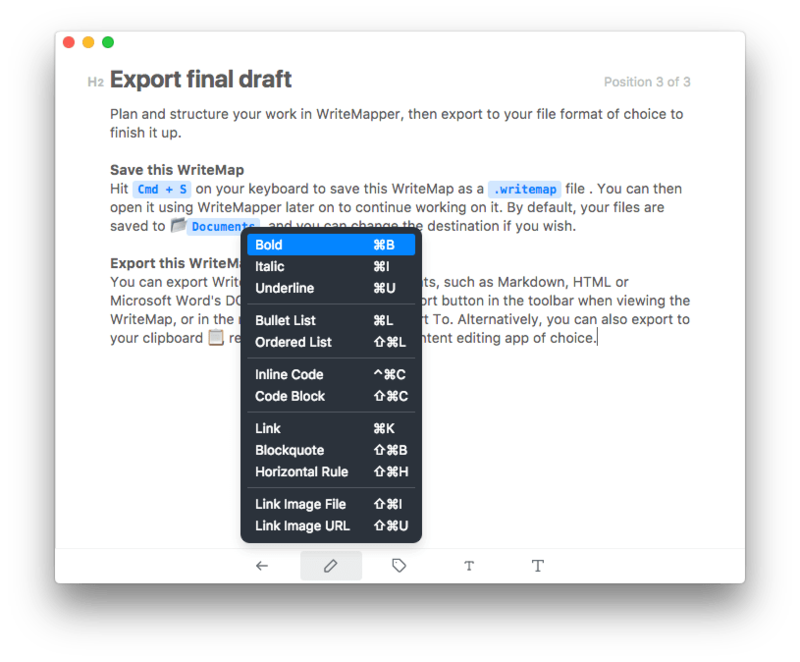 Use your writing app of choice with exports. Get a bird's-eye view of your writing structure. Spot and correct typos faster than ever. Automatically saves your work periodically. Import other filetypes into WriteMapper. Directly get a quick document overview. Mark nodes as done to know what's left. Illustrate your ideas by inserting images. Searches through topics of all nodes. Automatic, built-in backups of your work. All these features wrapped into an app that will skyrocket your writing productivity.